Paston01263 715779work01603 870304fax Self-cateringSet along a quiet back road in Cley-next-the-Sea, Paston makes an idyllic retreat from the stresses of modern life as it is set in a wildlife garden with a small orchard and natural pond. The sitting room leads onto a conservatory and the kitchen hosts a walk in pantry, 2 double bedrooms and a single room plus a family bathroom ensures you will have a comfortable stay. Cley is a delightful village and has a well known delicatessen and smokehouse, where you can find delicious meats and fish. The coastline boasts a host of villages each with their own character and the bustling towns of Burnham Market and Holt are both within easy reach. The historical houses of Holkham Hall, Blickling and Felbrigg Hall are also close to hand - there is plenty discover in this lovely part of the county. 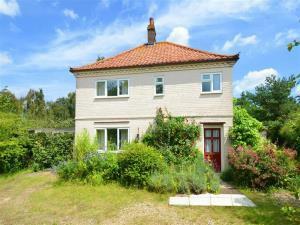 Set along a quiet back road in Cley-next-the-Sea, Paston makes an idyllic retreat from the stresses of modern life as it is set in a wildlife garden with a small orchard and natural pond. The sitting room leads onto a conservatory and the kitchen hosts a walk in pantry, 2 double bedrooms and a single room plus a family bathroom ensures you will have a comfortable stay. Cley is a delightful village and has a well known delicatessen and smokehouse, where you can find delicious meats and fish. The coastline boasts a host of villages each with their own character and the bustling towns of Burnham Market and Holt are both within easy reach. The historical houses of Holkham Hall, Blickling and Felbrigg Hall are also close to hand - there is plenty discover in this lovely part of the county.